Test all patients for evidence of current or prior hepatitis B virus (HBV) infection before initiating treatment with SOVALDI. HBV reactivation has been reported in HCV/HBV coinfected patients who were undergoing or had completed treatment with HCV direct acting antivirals and were not receiving HBV antiviral therapy. Some cases have resulted in fulminant hepatitis, hepatic failure, and death. Monitor HCV/HBV coinfected patients for hepatitis flare or HBV reactivation during HCV treatment and post-treatment follow-up. Initiate appropriate patient management for HBV infection as clinically indicated [see Warnings and Precautions (5.1)]. These highlights do not include all the information needed to use SOVALDI safely and effectively. See full prescribing information for SOVALDI. To report SUSPECTED ADVERSE REACTIONS, contact Gilead Sciences, Inc. at 1-800-GILEAD-5 or FDA at 1-800-FDA-1088 or www.fda.gov/medwatch. genotype 2 or 3 infection without cirrhosis or with compensated cirrhosis for use in combination with ribavirin. SOVALDI is indicated for the treatment of chronic HCV genotype 2 or 3 infection in pediatric patients 12 years of age and older or weighing at least 35 kg without cirrhosis or with compensated cirrhosis for use in combination with ribavirin [see Dosage and Administration (2.3) and Clinical Studies (14.5)]. Test all patients for evidence of current or prior HBV infection by measuring hepatitis B surface antigen (HBsAg) and hepatitis B core antibody (anti-HBc) before initiating HCV treatment with SOVALDI [see Warnings and Precautions (5.1)]. The recommended dosage of SOVALDI is one 400 mg tablet, taken orally, once daily with or without food [see Clinical Pharmacology (12.3)]. Administer SOVALDI in combination with ribavirin or in combination with pegylated interferon and ribavirin for the treatment of HCV. The recommended treatment regimen and duration for SOVALDI combination therapy is provided in Table 1. For patients with HCV/HIV-1 coinfection, follow the dosage recommendations in Table 1. Refer to Drug Interactions (7) for dosage recommendations for concomitant HIV-1 antiviral drugs. See peginterferon alfa prescribing information for dosage recommendation for patients with genotype 1 or 4 HCV. Dosage of ribavirin is weight-based (<75 kg = 1000 mg and ≥75 kg = 1200 mg). The daily dosage of ribavirin is administered orally in two divided doses with food. Patients with renal impairment (CrCl ≤50 mL/min) require ribavirin dosage reduction; refer to ribavirin prescribing information. Treatment-experienced patients have failed an interferon based regimen with or without ribavirin. SOVALDI in combination with ribavirin for 24 weeks can be considered as a therapeutic option for patients with genotype 1 infection who are ineligible to receive an interferon-based regimen [see Clinical Studies (14.4)]. Treatment decision should be guided by an assessment of the potential benefits and risks for the individual patient. Administer SOVALDI in combination with ribavirin for up to 48 weeks or until the time of liver transplantation, whichever occurs first, to prevent post-transplant HCV reinfection [see Use in Specific Populations (8.8)]. The recommended dosage of SOVALDI in pediatric patients 12 years of age and older or weighing at least 35 kg is one 400 mg tablet taken orally once daily with or without food in combination with ribavirin [see Clinical Pharmacology (12.3) and Clinical Studies (14.5)]. The recommended treatment regimen and duration for SOVALDI combination therapy is provided in Table 2. Table 3 provides the weight-based dosage of ribavirin when used in combination with SOVALDI for pediatric patients. For patients with HCV/HIV-1 coinfection, follow the dosage recommendations in Table 2 and Table 3. Refer to Drug Interactions (7) for dosage recommendations for concomitant HIV-1 antiviral drugs. See Table 3 for weight-based ribavirin dosing recommendations. The daily dosage of ribavirin is weight-based and is administered orally in two divided doses with food. Dosage reduction of SOVALDI is not recommended. If a patient has a serious adverse reaction potentially related to peginterferon alfa and/or ribavirin, the peginterferon alfa and/or ribavirin dosage should be reduced or discontinued, if appropriate, until the adverse reaction abates or decreases in severity. Refer to the peginterferon alfa and ribavirin prescribing information for additional information about how to reduce and/or discontinue the peginterferon alfa and/or ribavirin dosage. If the other agents used in combination with SOVALDI are permanently discontinued, SOVALDI should also be discontinued. No dosage recommendation can be given for patients with severe renal impairment (estimated Glomerular Filtration Rate [eGFR] less than 30 mL/min/1.73m2) or with end stage renal disease (ESRD) due to higher exposures (up to 20-fold) of the predominant sofosbuvir metabolite [see Use in Specific Populations (8.6) and Clinical Pharmacology (12.3)]. SOVALDI is available as a yellow-colored, capsule-shaped, film-coated tablet debossed with "GSI" on one side and "7977" on the other side. Each tablet contains 400 mg sofosbuvir. When SOVALDI is used in combination with ribavirin or peginterferon alfa/ribavirin, the contraindications applicable to those agents are applicable to combination therapies. Refer to the prescribing information of peginterferon alfa and ribavirin for a list of their contraindications. Hepatitis B virus (HBV) reactivation has been reported in HCV/HBV coinfected patients who were undergoing or had completed treatment with HCV direct acting antivirals, and who were not receiving HBV antiviral therapy. Some cases have resulted in fulminant hepatitis, hepatic failure, and death. Cases have been reported in patients who are HBsAg positive and also in patients with serologic evidence of resolved HBV infection (i.e., HBsAg negative and anti-HBc positive). HBV reactivation has also been reported in patients receiving certain immunosuppressant or chemotherapeutic agents; the risk of HBV reactivation associated with treatment with HCV direct-acting antivirals may be increased in these patients. HBV reactivation is characterized as an abrupt increase in HBV replication manifesting as a rapid increase in serum HBV DNA level. In patients with resolved HBV infection, reappearance of HBsAg can occur. Reactivation of HBV replication may be accompanied by hepatitis, i.e., increases in aminotransferase levels and, in severe cases, increases in bilirubin levels, liver failure, and death can occur. Test all patients for evidence of current or prior HBV infection by measuring HBsAg and anti-HBc before initiating HCV treatment with SOVALDI. In patients with serologic evidence of HBV infection, monitor for clinical and laboratory signs of hepatitis flare or HBV reactivation during HCV treatment with SOVALDI and during post-treatment follow-up. Initiate appropriate patient management for HBV infection as clinically indicated. Postmarketing cases of symptomatic bradycardia and cases requiring pacemaker intervention have been reported when amiodarone is coadministered with a sofosbuvir-containing regimen. A fatal cardiac arrest was reported in a patient taking amiodarone who was coadministered a sofosbuvir-containing regimen (HARVONI [ledipasvir/sofosbuvir]). Bradycardia has generally occurred within hours to days, but cases have been observed up to 2 weeks after initiating HCV treatment. Patients also taking beta blockers, or those with underlying cardiac comorbidities and/or advanced liver disease may be at increased risk for symptomatic bradycardia with coadministration of amiodarone. Bradycardia generally resolved after discontinuation of HCV treatment. The mechanism for this effect is unknown. Cardiac monitoring in an in-patient setting for the first 48 hours of coadministration is recommended, after which outpatient or self-monitoring of the heart rate should occur on a daily basis through at least the first 2 weeks of treatment. Patients who are taking SOVALDI who need to start amiodarone therapy due to no other alternative, viable treatment options should undergo similar cardiac monitoring as outlined above. Due to amiodarone's long half-life, patients discontinuing amiodarone just prior to starting SOVALDI should also undergo similar cardiac monitoring as outlined above. Patients who develop signs or symptoms of bradycardia should seek medical evaluation immediately. Symptoms may include near-fainting or fainting, dizziness or lightheadedness, malaise, weakness, excessive tiredness, shortness of breath, chest pains, confusion or memory problems [see Adverse Reactions (6.2), Drug Interactions (7.1)]. Drugs that are P-gp inducers in the intestine (e.g., rifampin, St. John's wort) may significantly decrease sofosbuvir plasma concentrations and may lead to a reduced therapeutic effect of SOVALDI. The use of rifampin and St. John's wort with SOVALDI is not recommended [see Drug Interactions (7.1)]. Because SOVALDI is used in combination with other antiviral drugs for treatment of HCV infection, consult the prescribing information for these drugs used in combination with SOVALDI. Warnings and Precautions related to these drugs also apply to their use in SOVALDI combination treatment. Serious Symptomatic Bradycardia When Coadministered with Amiodarone [see Warnings and Precautions (5.2)]. When SOVALDI is administered with ribavirin or peginterferon alfa/ribavirin, refer to the respective prescribing information for a description of adverse reactions associated with their use. 71 subjects who received placebo (PBO) for 12 weeks [see Clinical Studies (14)]. The proportion of subjects who permanently discontinued treatment due to adverse events was 4% for subjects receiving placebo, 1% for subjects receiving SOVALDI + ribavirin for 12 weeks, less than 1% for subjects receiving SOVALDI + ribavirin for 24 weeks, 11% for subjects receiving peginterferon alfa + ribavirin for 24 weeks and 2% for subjects receiving SOVALDI + peginterferon alfa + ribavirin for 12 weeks. Adverse events observed in at least 15% of subjects in the Phase 3 clinical trials outlined above are provided in Table 4. A side-by-side tabulation is displayed to simplify presentation; direct comparison across trials should not be made due to differing trial designs. The most common adverse events (at least 20%) for SOVALDI + ribavirin combination therapy were fatigue and headache. The most common adverse events (at least 20%) for SOVALDI + peginterferon alfa + ribavirin combination therapy were fatigue, headache, nausea, insomnia and anemia. Subjects received weight-based ribavirin (1000 mg per day if weighing <75 kg or 1200 mg per day if weighing ≥75 kg). Subjects received 800 mg ribavirin per day regardless of weight. With the exception of anemia and neutropenia, the majority of events presented in Table 4 occurred at severity of grade 1 in SOVALDI-containing regimens. Less Common Adverse Reactions Reported in Clinical Trials (less than 1%): The following adverse reactions occurred in less than 1% of subjects receiving SOVALDI in a combination regimen in any one trial. These events have been included because of their seriousness or assessment of potential causal relationship. Hematologic Effects: pancytopenia (particularly in subjects receiving concomitant pegylated interferon). Psychiatric Disorders: severe depression (particularly in subjects with pre-existing history of psychiatric illness), including suicidal ideation and suicide. Changes in selected hematological parameters are described in Table 5. A side-by-side tabulation is displayed to simplify presentation; direct comparison across trials should not be made due to differing trial designs. Total bilirubin elevation of more than 2.5×ULN was observed in none of the subjects in the SOVALDI + peginterferon alfa + ribavirin 12 weeks group and in 1%, 3% and 3% of subjects in the peginterferon alfa + ribavirin 24 weeks, SOVALDI + ribavirin 12 weeks and SOVALDI + ribavirin 24 weeks groups, respectively. Bilirubin levels peaked during the first 1 to 2 weeks of treatment and subsequently decreased and returned to baseline levels by post-treatment Week 4. These bilirubin elevations were not associated with transaminase elevations. Creatine kinase was assessed in the FISSION and NEUTRINO trials. Isolated, asymptomatic creatine kinase elevation of greater than or equal to 10×ULN was observed in less than 1%, 1% and 2% of subjects in the peginterferon alfa + ribavirin 24 weeks, SOVALDI + peginterferon alfa + ribavirin 12 weeks and SOVALDI + ribavirin 12 weeks groups, respectively. Isolated, asymptomatic lipase elevation of greater than 3×ULN was observed in less than 1%, 2%, 2%, and 2% of subjects in the SOVALDI + peginterferon alfa + ribavirin 12 weeks, SOVALDI + ribavirin 12 weeks, SOVALDI + ribavirin 24 weeks and peginterferon alfa + ribavirin 24 weeks groups, respectively. SOVALDI used in combination with ribavirin was assessed in 223 HCV/HIV-1 coinfected subjects [see Clinical Studies (14.4)]. The safety profile in HCV/HIV-1 coinfected subjects was similar to that observed in HCV mono-infected subjects. Elevated total bilirubin (grade 3 or 4) was observed in 30/32 (94%) subjects receiving atazanavir as part of the antiretroviral regimen. None of the subjects had concomitant transaminase increases. Among subjects not taking atazanavir, grade 3 or 4 elevated total bilirubin was observed in 2 (1.5%) subjects, similar to the rate observed with HCV mono-infected subjects receiving SOVALDI + ribavirin in Phase 3 trials. The safety assessment of SOVALDI in pediatric subjects 12 years of age and older is based on data from 50 subjects who were treated with SOVALDI plus ribavirin for 12 weeks (genotype 2 subjects) or 24 weeks (genotype 3 subjects) in a Phase 2, open-label clinical trial. The adverse reactions observed were consistent with those observed in clinical studies of SOVALDI plus ribavirin in adults [see Clinical Studies 14.5)]. The following adverse reactions have been identified during post approval use of SOVALDI. Because postmarketing reactions are reported voluntarily from a population of uncertain size, it is not always possible to reliably estimate their frequency or establish a causal relationship to drug exposure. Serious symptomatic bradycardia has been reported in patients taking amiodarone who initiate treatment with a sofosbuvir-containing regimen [see Warnings and Precautions (5.2), Drug Interactions (7.1)]. Sofosbuvir is a substrate of drug transporter P-gp and breast cancer resistance protein (BCRP) while the predominant circulating metabolite GS-331007 is not. Drugs that are P-gp inducers in the intestine (e.g., rifampin or St. John's wort) may decrease sofosbuvir plasma concentration, leading to reduced therapeutic effect of SOVALDI, and thus concomitant use with SOVALDI is not recommended [see Warnings and Precautions (5.3)]. Information on potential drug interactions with SOVALDI is summarized in Table 6. The table is not all-inclusive [see Warnings and Precautions (5.2, 5.3) and Clinical Pharmacology (12.3)]. Fluctuations in INR values may occur in patients receiving warfarin concomitant with HCV treatment, including treatment with SOVALDI. Frequent monitoring of INR values is recommended during treatment and post-treatment follow-up. This table is not all-inclusive. amiodarone Effect on amiodarone and sofosbuvir concentrations unknown Coadministration of amiodarone with a sofosbuvir-containing regimen may result in serious symptomatic bradycardia. The mechanism of this effect is unknown. Coadministration of amiodarone with SOVALDI is not recommended; if coadministration is required, cardiac monitoring is recommended [see Warnings and Precautions (5.2), Adverse Reactions (6.2)]. ↓ GS-331007 Coadministration of SOVALDI with carbamazepine, phenytoin, phenobarbital or oxcarbazepine is expected to decrease the concentration of sofosbuvir, leading to reduced therapeutic effect of SOVALDI. Coadministration is not recommended. ↓ GS-331007 Coadministration of SOVALDI with rifabutin or rifapentine is expected to decrease the concentration of sofosbuvir, leading to reduced therapeutic effect of SOVALDI. Coadministration is not recommended. Coadministration of SOVALDI with rifampin, an intestinal P-gp inducer, is not recommended [see Warnings and Precautions (5.3)]. ↓ GS-331007 Coadministration of SOVALDI with St. John's wort, an intestinal P-gp inducer, is not recommended [see Warnings and Precautions (5.3)]. ↓ GS-331007 Coadministration of SOVALDI with tipranavir/ritonavir is expected to decrease the concentration of sofosbuvir, leading to reduced therapeutic effect of SOVALDI. Coadministration is not recommended. In addition to the drugs included in Table 6, the interaction between SOVALDI and the following drugs was evaluated in clinical trials and no dose adjustment is needed for either drug [See Clinical Pharmacology (12.3)]: cyclosporine, darunavir/ritonavir, efavirenz, emtricitabine, methadone, oral contraceptives, raltegravir, rilpivirine, tacrolimus, or tenofovir disoproxil fumarate. If SOVALDI is administered with ribavirin or peginterferon alfa and ribavirin, the combination regimen is contraindicated in pregnant women and in men whose female partners are pregnant. Refer to the ribavirin and/or peginterferon alfa prescribing information for more information on ribavirin- and peginterferon alfa-associated risks of use during pregnancy. No adequate human data are available to establish whether or not SOVALDI poses a risk to pregnancy outcomes. In animal reproduction studies, no evidence of adverse developmental outcomes was observed with sofosbuvir at exposures greater than those in humans at the recommended human dose (RHD) [see Data]. During organogenesis in the rat and rabbit, systemic exposures (AUC) to the predominant circulating metabolite of sofosbuvir (GS-331007) were ≥5 (rats) and 12 (rabbits) times the exposure in humans at the RHD. In the rat pre/postnatal development study, maternal systemic exposure (AUC) to GS-331007 was ≥6 times the exposure in humans at the RHD. The background risk of major birth defects and miscarriage for the indicated population is unknown. In the U.S. general population, the estimated background risk of major birth defects and miscarriage in clinically recognized pregnancies is 2–4% and 15–20%, respectively. Sofosbuvir was administered orally to pregnant rats (up to 500 mg/kg/day) and rabbits (up to 300 mg/kg/day) on gestation days 6 to 18 and 6 to 19, respectively, and also to rats (oral doses up to 500 mg/kg/day) on gestation day 6 to lactation/post-partum day 20. No significant effects on embryo-fetal (rats and rabbits) or pre/postnatal (rats) development were observed at the highest doses tested. Systemic exposures (AUC) to the predominant circulating metabolite of sofosbuvir (GS-331007) were ≥5 (rats) and 12 (rabbits) times the exposure in humans at the RHD, with exposures increasing during gestation from approximately 5 to 10 (rats) and 12 to 28 (rabbits) times the exposure in humans at the RHD. It is not known whether sofosbuvir or its metabolites are present in human breast milk, affect human milk production or have effects on the breastfed infant. The predominant circulating metabolite of sofosbuvir (GS-331007) was the primary component observed in the milk of lactating rats, without effect on nursing pups [see Data]. The developmental and health benefits of breastfeeding should be considered along with the mother's clinical need for SOVALDI and any potential adverse effects on the breastfed child from SOVALDI or from the underlying maternal condition. If SOVALDI is administered with ribavirin, the nursing mother's information for ribavirin also applies to this combination regimen. Refer to the ribavirin prescribing information for more information on use during lactation. No effects of sofosbuvir on growth and postnatal development were observed in nursing pups at the highest dose tested in rats. Maternal systemic exposure (AUC) to the predominant circulating metabolite of sofosbuvir (GS-331007) was approximately 12 times the exposure in humans at the RHD, with exposure of approximately 2% that of maternal exposure observed in nursing pups on lactation day 10. In a lactation study, sofosbuvir metabolites (primarily GS-331007) were excreted into the milk of lactating rats following administration of a single oral dose of sofosbuvir (20 mg/kg) on lactation day 2, with milk concentrations of approximately 10% that of maternal plasma concentrations observed 1 hour post-dose. If SOVALDI is administered with ribavirin or peginterferon and ribavirin, the information for ribavirin and peginterferon with regard to pregnancy testing, contraception, and infertility also applies to these combination regimens. Refer to ribavirin and/or peginterferon prescribing information for additional information. The safety, pharmacokinetics, and efficacy of SOVALDI in pediatric patients 12 years of age and older or weighing at least 35 kg with genotype 2 and 3 infection have been established. SOVALDI was evaluated in an open-label clinical trial (Study 1112), which included 50 subjects (13 genotype 2; 37 genotype 3) 12 years of age and older. The safety, pharmacokinetics, and efficacy were comparable to that observed in adults [see Dosage and Administration (2.3), Adverse Reactions (6.1), Clinical Pharmacology (12.3), and Clinical Studies (14.5)]. The safety and efficacy of SOVALDI in pediatric patients 12 years of age and older or weighing at least 35 kg with compensated cirrhosis is supported by comparable sofosbuvir and GS-331007 exposures between: 1) adults and adolescents without cirrhosis and 2) adults without cirrhosis and adults with compensated cirrhosis. Thus, similar efficacy would be expected for adolescent patients with compensated cirrhosis as adults with compensated cirrhosis. The safety and efficacy of SOVALDI have not been established in pediatric patients less than 12 years of age and weighing less than 35 kg with HCV genotype 2 or 3. The safety and efficacy of SOVALDI have not been established in pediatric patients with HCV genotype 1 or 4. SOVALDI was administered to 90 subjects aged 65 and over. The response rates observed for subjects over 65 years of age were similar to that of younger subjects across treatment groups. No dosage adjustment of SOVALDI is warranted in geriatric patients [see Clinical Pharmacology (12.3)]. No dosage adjustment of SOVALDI is required for patients with mild or moderate renal impairment. The safety and efficacy of SOVALDI have not been established in patients with severe renal impairment (eGFR less than 30 mL/min/1.73m2) or ESRD requiring hemodialysis. No dosage recommendation can be given for patients with severe renal impairment or ESRD [see Dosage and Administration (2.6) and Clinical Pharmacology (12.3)]. Refer also to ribavirin and peginterferon alfa prescribing information for patients with CrCl less than 50 mL/min. No dosage adjustment of SOVALDI is required for patients with mild, moderate or severe hepatic impairment (Child-Pugh Class A, B or C) [see Clinical Pharmacology (12.3)]. Safety and efficacy of SOVALDI have not been established in patients with decompensated cirrhosis. See peginterferon alfa prescribing information for contraindication in hepatic decompensation. SOVALDI was studied in HCV-infected adult subjects with hepatocellular carcinoma prior to undergoing liver transplantation in an open-label clinical trial evaluating the safety and efficacy of SOVALDI and ribavirin administered pre-transplant to prevent post-transplant HCV reinfection. The primary endpoint of the trial was post-transplant virologic response (pTVR) defined as HCV RNA less than lower limit of quantification (LLOQ) at 12 weeks post-transplant. HCV-infected subjects, regardless of genotype, with hepatocellular carcinoma (HCC) meeting the MILAN criteria (defined as the presence of a tumor 5 cm or less in diameter in patients with single hepatocellular carcinomas and no more than three tumor nodules, each 3 cm or less in diameter in patients with multiple tumors and no extrahepatic manifestations of the cancer or evidence of vascular invasion of tumor) received 400 mg SOVALDI and weight-based 1000–1200 mg ribavirin daily for 24-48 weeks or until the time of liver transplantation, whichever occurred first. An interim analysis was conducted on 61 subjects who received SOVALDI and ribavirin; 45 subjects had HCV genotype 1; 44 subjects had a baseline CPT score less than 7 and all subjects had a baseline unadjusted MELD score up to 14. Of these 61 subjects, 41 subjects underwent liver transplantation following up to 48 weeks of treatment with SOVALDI and ribavirin; 37 had HCV RNA less than LLOQ at the time of transplantation. Of the 37 subjects, the post-transplant virologic response (pTVR) rate is 64% (23/36) in the 36 evaluable subjects who have reached the 12 week post-transplant time point. The safety profile of SOVALDI and ribavirin in HCV-infected subjects prior to liver transplantation was comparable to that observed in subjects treated with SOVALDI and ribavirin in Phase 3 clinical trials. The safety and efficacy of SOVALDI have not been established in post-liver transplant patients. Available data on subjects with genotype 5 or 6 HCV infection are insufficient for dosing recommendations. The highest documented dosage of sofosbuvir was a single dose of sofosbuvir 1200 mg (three times the recommended dosage) administered to 59 healthy subjects. In that trial, there were no untoward effects observed at this dosage level, and adverse events were similar in frequency and severity to those reported in the placebo and sofosbuvir 400 mg treatment groups. The effects of higher dosages are not known. No specific antidote is available for overdose with SOVALDI. If overdose occurs, the patient must be monitored for evidence of toxicity. Treatment of overdose with SOVALDI consists of general supportive measures including monitoring of vital signs as well as observation of the clinical status of the patient. A 4-hour hemodialysis session removed 18% of the administered dose. SOVALDI (sofosbuvir) is a nucleotide analog inhibitor of HCV NS5B polymerase. Sofosbuvir is a white to off-white crystalline solid with a solubility of ≥ 2 mg/mL across the pH range of 2–7.7 at 37 °C and is slightly soluble in water. SOVALDI tablets are for oral administration. Each tablet contains 400 mg of sofosbuvir. The tablets include the following inactive ingredients: colloidal silicon dioxide, croscarmellose sodium, magnesium stearate, mannitol, and microcrystalline cellulose. The tablets are film-coated with a coating material containing the following inactive ingredients: polyethylene glycol, polyvinyl alcohol, talc, titanium dioxide, and yellow iron oxide. Sofosbuvir is a direct-acting antiviral agent against the hepatitis C virus [see Microbiology (12.4)]. The effect of sofosbuvir 400 and 1200 mg (three times the recommended dosage) on QTc interval was evaluated in a randomized, single-dose, placebo- and active-controlled (moxifloxacin 400 mg) four period crossover thorough QT trial in 59 healthy subjects. At a dosage three times the maximum recommended dosage, SOVALDI does not prolong QTc to any clinically relevant extent. The pharmacokinetic properties of sofosbuvir and the predominant circulating metabolite GS-331007 have been evaluated in healthy adult subjects and in subjects with chronic hepatitis C. Following oral administration of SOVALDI, sofosbuvir was absorbed with a peak plasma concentration observed at ~0.5–2 hour post-dose, regardless of dose level. Peak plasma concentration of GS-331007 was observed between 2 to 4 hours post-dose. Based on population pharmacokinetic analysis in subjects with genotype 1 to 6 HCV infection who were coadministered ribavirin (with or without pegylated interferon), geometric mean steady state AUC0–24 was 969 ng∙hr/mL for sofosbuvir (N=838), and 6790 ng∙hr/mL for GS-331007 (N=1695). Relative to healthy subjects administered sofosbuvir alone (N=272), the sofosbuvir AUC0–24 was 60% higher; and GS-331007 AUC0–24 was 39% lower, respectively, in HCV-infected subjects. Sofosbuvir and GS-331007 AUCs are near dose proportional over the dose range of 200 mg to 1200 mg. Relative to fasting conditions, the administration of a single dose of SOVALDI with a standardized high fat meal did not substantially affect the sofosbuvir Cmax or AUC0–inf. The exposure of GS-331007 was not altered in the presence of a high-fat meal. Therefore, SOVALDI can be administered without regard to food. Sofosbuvir is approximately 61–65% bound to human plasma proteins and the binding is independent of drug concentration over the range of 1 microgram/mL to 20 microgram/mL. Protein binding of GS-331007 was minimal in human plasma. After a single 400 mg dose of [14C]-sofosbuvir in healthy subjects, the blood to plasma ratio of 14C-radioactivity was approximately 0.7. Sofosbuvir is extensively metabolized in the liver to form the pharmacologically active nucleoside analog triphosphate GS-461203. The metabolic activation pathway involves sequential hydrolysis of the carboxyl ester moiety catalyzed by human cathepsin A (CatA) or carboxylesterase 1 (CES1) and phosphoramidate cleavage by histidine triad nucleotide-binding protein 1 (HINT1) followed by phosphorylation by the pyrimidine nucleotide biosynthesis pathway. 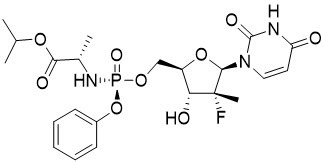 Dephosphorylation results in the formation of nucleoside metabolite GS-331007 that cannot be efficiently rephosphorylated and lacks anti-HCV activity in vitro. After a single 400 mg oral dose of [14C]-sofosbuvir, sofosbuvir and GS-331007 accounted for approximately 4% and greater than 90% of drug related material (sum of molecular weight-adjusted AUC of sofosbuvir and its metabolites) systemic exposure, respectively. Following a single 400 mg oral dose of [14C]-sofosbuvir, mean total recovery of the dose was greater than 92%, consisting of approximately 80%, 14%, and 2.5% recovered in urine, feces, and expired air, respectively. The majority of the sofosbuvir dose recovered in urine was GS-331007 (78%) while 3.5% was recovered as sofosbuvir. These data indicate that renal clearance is the major elimination pathway for GS-331007. The median terminal half-lives of sofosbuvir and GS-331007 were 0.4 and 27 hours, respectively. Population pharmacokinetics analysis in HCV-infected subjects indicated that race had no clinically relevant effect on the exposure of sofosbuvir and GS-331007. No clinically relevant pharmacokinetic differences have been observed between men and women for sofosbuvir and GS-331007. The pharmacokinetics of sofosbuvir and GS-331007 were determined in 50 pediatric subjects 12 years of age and older, infected with HCV genotype 2 or 3, receiving a daily dose of SOVALDI (400 mg sofosbuvir). The pharmacokinetic properties of sofosbuvir and GS-331007 in pediatric subjects 12 years of age and older are provided in Table 7. Exposures in pediatric subjects were similar to those observed in adults. The pharmacokinetics of sofosbuvir have not been established in pediatric subjects less than 12 years of age [see Use in Specific Populations (8.4)]. Population pharmacokinetic analysis in HCV-infected subjects showed that within the age range (19 to 75 years) analyzed, age did not have a clinically relevant effect on the exposure to sofosbuvir and GS-331007 [see Use in Specific Populations (8.5)]. The pharmacokinetics of sofosbuvir were studied in HCV negative subjects with mild (eGFR between 50 to less than 80 mL/min/1.73m2), moderate (eGFR between 30 to less than 50 mL/min/1.73m2), severe renal impairment (eGFR less than 30 mL/min/1.73m2) and subjects with end stage renal disease (ESRD) requiring hemodialysis following a single 400 mg dose of sofosbuvir. Relative to subjects with normal renal function (eGFR greater than 80 mL/min/1.73m2), the sofosbuvir AUC0–inf was 61%, 107% and 171% higher in mild, moderate and severe renal impairment, while the GS-331007 AUC0–inf was 55%, 88% and 451% higher, respectively. In subjects with ESRD, relative to subjects with normal renal function, sofosbuvir and GS-331007 AUC0–inf was 28% and 1280% higher when sofosbuvir was dosed 1 hour before hemodialysis compared with 60% and 2070% higher when sofosbuvir was dosed 1 hour after hemodialysis, respectively. A 4 hour hemodialysis session removed approximately 18% of administered dose. No dosage adjustment is required for patients with mild or moderate renal impairment. The safety and efficacy of SOVALDI have not been established in patients with severe renal impairment or ESRD. No dosage recommendation can be given for patients with severe renal impairment or ESRD [see Dosage and Administration (2.6) and Use in Specific Populations (8.6)]. The pharmacokinetics of sofosbuvir were studied following 7-day dosing of 400 mg sofosbuvir in HCV-infected subjects with moderate and severe hepatic impairment (Child-Pugh Class B and C). Relative to subjects with normal hepatic function, the sofosbuvir AUC0–24 were 126% and 143% higher in moderate and severe hepatic impairment, while the GS-331007 AUC0–24 were 18% and 9% higher, respectively. Population pharmacokinetics analysis in HCV-infected subjects indicated that cirrhosis had no clinically relevant effect on the exposure of sofosbuvir and GS-331007. No dosage adjustment of SOVALDI is recommended for patients with mild, moderate or severe hepatic impairment [see Use in Specific Populations (8.7)]. Sofosbuvir is a substrate of drug transporter P-gp and breast cancer resistance protein (BCRP) while GS-331007 is not. Drugs that are P-gp inducers in the intestine (e.g., rifampin or St. John's wort) may decrease sofosbuvir plasma concentration, leading to reduced therapeutic effect of SOVALDI, and thus concomitant use with SOVALDI is not recommended [see Warnings and Precautions (5.3) and Drug Interactions (7.1)]. Coadministration of SOVALDI with drugs that inhibit P-gp and/or BCRP may increase sofosbuvir plasma concentration without increasing GS-331007 plasma concentration; accordingly, SOVALDI may be coadministered with P-gp and/or BCRP inhibitors. Sofosbuvir and GS-331007 are not inhibitors of P-gp and BCRP and thus are not expected to increase exposures of drugs that are substrates of these transporters. The intracellular metabolic activation pathway of sofosbuvir is mediated by generally low affinity and high capacity hydrolase and nucleotide phosphorylation pathways that are unlikely to be affected by concomitant drugs. The effects of coadministered drugs on the exposure of sofosbuvir and GS-331007 are shown in Table 8. The effects of sofosbuvir on the exposure of coadministered drugs are shown in Table 9 [see Drug Interactions (7.2)]. No effect on the pharmacokinetic parameters of sofosbuvir and GS-331007 was observed with raltegravir. No effect on the pharmacokinetic parameters of the following coadministered drugs was observed with sofosbuvir: cyclosporine, darunavir/ritonavir, efavirenz, emtricitabine, methadone, or rilpivirine. Sofosbuvir is an inhibitor of the HCV NS5B RNA-dependent RNA polymerase, which is essential for viral replication. Sofosbuvir is a nucleotide prodrug that undergoes intracellular metabolism to form the pharmacologically active uridine analog triphosphate (GS-461203), which can be incorporated into HCV RNA by the NS5B polymerase and acts as a chain terminator. In a biochemical assay, GS-461203 inhibited the polymerase activity of the recombinant NS5B from HCV genotype 1b, 2a, 3a and 4a with IC50 values ranging from 0.7 to 2.6 micromolar. GS-461203 is neither an inhibitor of human DNA and RNA polymerases nor an inhibitor of mitochondrial RNA polymerase. In HCV replicon assays, the EC50 values of sofosbuvir against full-length replicons from genotype 1a, 1b, 2a, 3a and 4a, and chimeric 1b replicons encoding NS5B from genotype 2b, 5a or 6a ranged from 0.014 to 0.11 micromolar. The median EC50 value of sofosbuvir against chimeric replicons encoding NS5B sequences from clinical isolates was 0.062 micromolar for genotype 1a (range 0.029–0.128 micromolar; N=67), 0.102 micromolar for genotype 1b (range 0.045–0.170 micromolar; N=29), 0.029 micromolar for genotype 2 (range 0.014–0.081 micromolar; N=15) and 0.081 micromolar for genotype 3a (range 0.024–0.181 micromolar; N=106). In infectious virus assays, the EC50 values of sofosbuvir against genotype 1a and 2a were 0.03 and 0.02 micromolar, respectively. The presence of 40% human serum had no effect on the anti-HCV activity of sofosbuvir. Evaluation of sofosbuvir in combination with interferon alpha or ribavirin showed no antagonistic effect in reducing HCV RNA levels in replicon cells. HCV replicons with reduced susceptibility to sofosbuvir have been selected in cell culture for multiple genotypes including 1b, 2a, 2b, 3a, 4a, 5a and 6a. Reduced susceptibility to sofosbuvir was associated with the primary NS5B substitution S282T in all replicon genotypes examined. An M289L substitution developed along with the S282T substitution in genotype 2a, 5 and 6 replicons. Site-directed mutagenesis of the S282T substitution in replicons of 8 genotypes conferred 2- to 18-fold reduced susceptibility to sofosbuvir and reduced the replication viral capacity by 89% to 99% compared to the corresponding wild-type. In biochemical assays, recombinant NS5B polymerase from genotypes 1b, 2a, 3a and 4a expressing the S282T substitution showed reduced susceptibility to GS-461203 compared to respective wild-types. In a pooled analysis of 982 subjects who received SOVALDI in Phase 3 trials, 224 subjects had post-baseline NS5B genotypic data from next generation nucleotide sequencing (assay cutoff of 1%). Treatment-emergent substitutions L159F (n=6) and V321A (n=5) were detected in post-baseline samples from GT3a-infected subjects across the Phase 3 trials. No detectable shift in the phenotypic susceptibility to sofosbuvir of subject isolates with L159F or V321A substitutions was seen. The sofosbuvir-associated resistance substitution S282T was not detected at baseline or in the failure isolates from Phase 3 trials. However, an S282T substitution was detected in one genotype 2b subject who relapsed at Week 4 post-treatment after 12 weeks of sofosbuvir monotherapy in the Phase 2 trial P7977-0523 [ELECTRON]. The isolate from this subject displayed a mean 13.5-fold reduced susceptibility to sofosbuvir. For this subject, the S282T substitution was no longer detectable at Week 12 post-treatment by next generation sequencing with an assay cutoff of 1%. In the trial done in subjects with hepatocellular carcinoma awaiting liver transplantation where subjects received up to 48 weeks of sofosbuvir and ribavirin, the L159F substitution emerged in multiple subjects with GT1a or GT2b HCV who experienced virologic failure (breakthrough and relapse). Furthermore, the presence of substitutions L159F and/or C316N at baseline was associated with sofosbuvir breakthrough and relapse post-transplant in multiple subjects infected with GT1b HCV. In addition, S282R and L320F substitutions were detected on-treatment by next generation sequencing in a subject infected with GT1a HCV with a partial treatment response. The clinical significance of these substitutions is not known. HCV replicons expressing the sofosbuvir-associated resistance substitution S282T were susceptible to NS5A inhibitors and ribavirin. HCV replicons expressing the ribavirin-associated substitutions T390I and F415Y were susceptible to sofosbuvir. Sofosbuvir was active against HCV replicons with NS3/4A protease inhibitor, NS5B non-nucleoside inhibitor and NS5A inhibitor resistant variants. Use with Ribavirin and/or Peginterferon alfa: Refer to prescribing information for ribavirin and/or peginterferon alfa for information on carcinogenesis and mutagenesis. Sofosbuvir was not genotoxic in a battery of in vitro or in vivo assays, including bacterial mutagenicity, chromosome aberration using human peripheral blood lymphocytes and in vivo mouse micronucleus assays. Two-year carcinogenicity studies in mice and rats were conducted with sofosbuvir. Mice were administered doses of up to 200 mg/kg/day in males and 600 mg/kg/day in females, while rats were administered doses of up to 750 mg/kg/day in males and females. No increase in the incidence of drug-related neoplasms were observed at the highest doses tested in mice and rats, resulting in AUC exposure to the predominant circulating metabolite GS-331007 of approximately 7 and 30 times (in mice) and 13 and 17 times (in rats), in males and females respectively, the exposure in humans at the recommended clinical dose. Use with Ribavirin and/or Peginterferon alfa: Refer to prescribing information for ribavirin and/or peginterferon alfa for information on impairment of fertility. Sofosbuvir had no effects on embryo-fetal viability or on fertility when evaluated in rats. At the highest dose tested, AUC exposure to the predominant circulating metabolite GS-331007 was approximately 8 times the exposure in humans at the recommended clinical dose. The safety and efficacy of SOVALDI was evaluated in five Phase 3 trials in a total of 1724 HCV mono-infected subjects with genotypes 1 to 6 chronic hepatitis C virus, one Phase 3 trial in 223 HCV/HIV-1 coinfected subjects with genotype 1, 2 or 3 HCV, and one trial in 50 pediatric subjects 12 years of age and older with genotype 2 or 3 HCV, as summarized in Table 10 [see Clinical Studies (14.2, 14.3, 14.4, and 14.5)]. Subjects in the adult trials did not have cirrhosis or had compensated cirrhosis. SOVALDI was administered at a dose of 400 mg once daily. The ribavirin (RBV) dosage for adult subjects was weight-based at 1000–1200 mg daily administered in two divided doses when used in combination with SOVALDI, and the peginterferon alfa 2a dosage, where applicable, was 180 micrograms per week. Treatment duration was fixed in each trial and was not guided by subjects' HCV RNA levels (no response guided algorithm). Plasma HCV RNA values were measured during the clinical trials using the COBAS TaqMan HCV test (version 2.0), for use with the High Pure System. The assay had a lower limit of quantification (LLOQ) of 25 IU per mL. Sustained virologic response (SVR12) was the primary endpoint which was defined as HCV RNA less than LLOQ at 12 weeks after the end of treatment. NEUTRINO was an open-label, single-arm trial that evaluated 12 weeks of treatment with SOVALDI in combination with peginterferon alfa 2a and ribavirin in treatment-naïve subjects with genotype 1, 4, 5 or 6 HCV infection compared to pre-specified historical control. Treated subjects (N=327) had a median age of 54 years (range: 19 to 70); 64% of the subjects were male; 79% were White, 17% were Black; 14% were Hispanic or Latino; mean body mass index was 29 kg/m2 (range: 18 to 56 kg/m2); 78% had baseline HCV RNA greater than 6 log10 IU per mL; 17% had cirrhosis; 89% had HCV genotype 1; 9% had HCV genotype 4 and 2% had HCV genotype 5 or 6. Table 11 presents the SVR12 for the treatment group of SOVALDI + peginterferon alfa + ribavirin in subjects with genotype 1 or 4 HCV. Available data on subjects with genotype 5 or 6 HCV treated with SOVALDI + peginterferon alfa + ribavirin for 12 weeks were insufficient for dosing recommendations; therefore these results are not presented in Table 11 [see Use in Specific Populations (8.10)]. One subject had genotype 1a/1b mixed infection. The denominator for relapse is the number of subjects with HCV RNA <LLOQ at their last on-treatment assessment. Other includes subjects who did not achieve SVR and did not meet virologic failure criteria (e.g., lost to follow-up). SVR12 for selected subgroups are presented in Table 12. SVR12 rates were 99% (89/90) in subjects with genotype 1 or 4 HCV and baseline IL28B C/C allele and 87% (200/230) in subjects with genotype 1 or 4 HCV and baseline IL28B non-C/C alleles. It is estimated that the SVR12 in patients who previously failed pegylated interferon and ribavirin therapy will approximate the observed SVR12 in NEUTRINO subjects with multiple baseline factors traditionally associated with a lower response to interferon-based treatment (Table 12). The SVR12 rate in the NEUTRINO trial in genotype 1 subjects with IL28B non-C/C alleles, HCV RNA greater than 800,000 IU/mL and Metavir F3/F4 fibrosis was 71% (37/52). FISSION was a randomized, open-label, active-controlled trial that evaluated 12 weeks of treatment with SOVALDI and ribavirin compared to 24 weeks of treatment with peginterferon alfa 2a and ribavirin in treatment-naïve subjects with genotype 2 and 3 HCV. The ribavirin dosage used in the SOVALDI + ribavirin and peginterferon alfa 2a + ribavirin arms were weight-based 1000–1200 mg per day and 800 mg per day regardless of weight, respectively. Subjects were randomized in a 1:1 ratio and stratified by cirrhosis (presence vs. absence), HCV genotype (2 vs. 3) and baseline HCV RNA level (less than 6 log10 IU/mL vs. at least 6 log10 IU/mL). Subjects with genotype 2 or 3 HCV were enrolled in an approximately 1:3 ratio. Treated subjects (N=499) had a median age of 50 years (range: 19 to 77); 66% of the subjects were male; 87% were White, 3% were Black; 14% were Hispanic or Latino; mean body mass index was 28 kg/m2 (range: 17 to 52 kg/m2); 57% had baseline HCV RNA levels greater than 6 log10 IU per mL; 20% had cirrhosis; 72% had HCV genotype 3. Table 13 presents the SVR12 for the treatment groups of SOVALDI + ribavirin and peginterferon alfa + ribavirin in subjects with genotype 2 HCV. SVR12 for genotype 3 subjects treated with SOVALDI + ribavirin for 12 weeks was suboptimal; therefore these results are not presented in Table 13. Including three subjects with recombinant genotype 2/1 HCV infection. SVR12 for genotype 2 HCV-infected subjects with cirrhosis at baseline are presented in Table 14. POSITRON was a randomized, double-blinded, placebo-controlled trial that evaluated 12 weeks of treatment with SOVALDI and ribavirin (N=207) compared to placebo (N=71) in subjects who are interferon intolerant, ineligible or unwilling. Subjects were randomized in 3:1 ratio and stratified by cirrhosis (presence vs. absence). Treated subjects (N=278) had a median age of 54 years (range: 21 to 75); 54% of the subjects were male; 91% were White, 5% were Black; 11% were Hispanic or Latino; mean body mass index was 28 kg/m2 (range: 18 to 53 kg/m2); 70% had baseline HCV RNA levels greater than 6 log10 IU per mL; 16% had cirrhosis; 49% had HCV genotype 3. The proportions of subjects who were interferon intolerant, ineligible, or unwilling were 9%, 44%, and 47%, respectively. Most subjects had no prior HCV treatment (81%). Table 15 presents the SVR12 for the treatment groups of SOVALDI + ribavirin and placebo in subjects with genotype 2 HCV. SVR12 for genotype 3 subjects treated with SOVALDI + ribavirin for 12 weeks was suboptimal; therefore these results are not presented in Table 15. Table 16 presents the subgroup analysis for cirrhosis and interferon classification in subjects with genotype 2 HCV. FUSION was a randomized, double-blinded trial that evaluated 12 or 16 weeks of treatment with SOVALDI and ribavirin in subjects who did not achieve SVR with prior interferon-based treatment (relapsers and nonresponders). Subjects were randomized in a 1:1 ratio and stratified by cirrhosis (presence vs. absence) and HCV genotype (2 vs. 3). Treated subjects (N=201) had a median age of 56 years (range: 24 to 70); 70% of the subjects were male; 87% were White; 3% were Black; 9% were Hispanic or Latino; mean body mass index was 29 kg/m2 (range: 19 to 44 kg/m2); 73% had baseline HCV RNA levels greater than 6 log10 IU per mL; 34% had cirrhosis; 63% had HCV genotype 3; 75% were prior relapsers. Table 17 presents the SVR12 for the treatment groups of SOVALDI + ribavirin for 12 weeks in subjects with genotype 2 HCV. Treatment of 16 weeks in subjects with genotype 2 HCV was not shown to increase the SVR12 observed with 12 weeks of treatment. SVR12 for genotype 3 subjects treated with SOVALDI + ribavirin for 12 or 16 weeks was suboptimal; therefore these results are not presented in Table 17. Table 18 presents the subgroup analysis for cirrhosis and response to prior HCV treatment in subjects with genotype 2 HCV. The VALENCE trial evaluated SOVALDI in combination with weight-based ribavirin for the treatment of genotype 2 or 3 HCV infection in treatment-naïve subjects or subjects who did not achieve SVR with prior interferon-based treatment, including subjects with compensated cirrhosis. The original trial design was a 4 to 1 randomization to SOVALDI + ribavirin for 12 weeks or placebo. Based on emerging data, this trial was unblinded and all genotype 2 HCV-infected subjects continued the original planned treatment and received SOVALDI + ribavirin for 12 weeks, and duration of treatment with SOVALDI + ribavirin in genotype 3 HCV-infected subjects was extended to 24 weeks. Eleven genotype 3 subjects had already completed SOVALDI + ribavirin for 12 weeks at the time of the amendment. Treated subjects (N=419) had a median age of 51 years (range: 19 to 74); 60% of the subjects were male; mean body mass index was 26 kg/m2 (range: 17 to 44 kg/m2); the mean baseline HCV RNA level was 6.4 log10 IU per mL; 78% had HCV genotype 3; 58% of the subjects were treatment-experienced and 65% of those subjects experienced relapse/breakthrough to prior HCV treatment. Table 19 presents the SVR12 for the treatment groups of SOVALDI + ribavirin for 12 weeks and 24 weeks. Placebo subjects (N=85) were not included as none achieved SVR12. Other includes subjects who did not achieve SVR12 and did not meet virologic failure criteria (e.g., lost to follow-up). Table 20 presents the subgroup analysis by genotype for cirrhosis and prior HCV treatment experience. SOVALDI was studied in an open-label clinical trial (Study PHOTON-1) evaluating the safety and efficacy of 12 or 24 weeks of treatment with SOVALDI and ribavirin in adult subjects with genotype 1, 2 or 3 chronic hepatitis C coinfected with HIV-1. Genotype 2 and 3 subjects were either HCV treatment-naïve or experienced, whereas genotype 1 subjects were all treatment-naïve. Subjects received 400 mg SOVALDI and weight-based ribavirin (1000 mg for subjects weighing less than 75 kg or 1200 mg for subjects weighing at least 75 kg) daily for 12 or 24 weeks based on genotype and prior treatment history. Subjects were either not on antiretroviral therapy with a CD4+ cell count greater than 500 cells/mm3 or had virologically suppressed HIV-1 with a CD4+ cell count greater than 200 cells/mm3. Efficacy data 12 weeks post treatment are available for 210 subjects (see Table 21). Subjects with genotype 2 HCV treated with SOVALDI + RBV for 24 weeks (N=15) and subjects with genotype 3 HCV treated with SOVALDI + RBV for 12 weeks (N=42) are not included in the table. In subjects with HCV genotype 1 infection, the SVR12 rate was 82% (74/90) in subjects with genotype 1a infection and 54% (13/24) in subjects with genotype 1b infection, with relapse accounting for the majority of treatment failures. SVR12 rates in subjects with HCV genotype 1 infection were 80% (24/30) in subjects with baseline IL28B C/C allele and 75% (62/83) in subjects with baseline IL28B non-C/C alleles. In the 223 HCV subjects with HIV-1 coinfection, the percentage of CD4+ cells did not change during treatment. Median CD4+ cell count decreases of 85 cells/mm3 and 84 cells/mm3 were observed at the end of treatment with SOVALDI + ribavirin for 12 or 24 weeks, respectively. HIV-1 rebound during SOVALDI + ribavirin treatment occurred in 2 subjects (0.9%) on antiretroviral therapy. The efficacy of SOVALDI in HCV-infected pediatric subjects 12 years of age and older was evaluated in 50 subjects with HCV genotype 2 (N = 13) or genotype 3 (N = 37) in a Phase 2, open label clinical trial. Subjects with HCV genotype 2 or 3 infection in the trial were treated with SOVALDI and weight-based ribavirin for 12 or 24 weeks, respectively [see Dosage and Administration (2.3)]. Of the 50 treated subjects, the median age was 15 years (range: 12 to 17); 42% of the subjects were female; 90% were White, 4% were Black, and 2% were Asian; 4% were Hispanic/Latino; mean weight was 61 kg (range: 30 to 101 kg); 18% were treatment experienced; 66% had baseline HCV RNA levels greater than or equal to 800,000 IU/mL; 74% of subjects had non-CC IL28B alleles (CT or TT); and no subjects had known cirrhosis. The majority of subjects (69%) had been infected through vertical transmission. The SVR12 rate was 100% (13/13) in genotype 2 subjects and 97% (36/37) in genotype 3 subjects. No subject experienced on-treatment virologic failure or relapse. SOVALDI tablets are yellow, capsule-shaped, film-coated tablets containing 400 mg sofosbuvir debossed with "GSI" on one side and "7977" on the other side. Each bottle contains 28 tablets (NDC 61958-1501-1), a silica gel desiccant and polyester coil with a child-resistant closure. Store at room temperature below 30 °C (86 °F). Inform patients that HBV reactivation can occur in patients coinfected with HBV during or after treatment of HCV infection. Advise patients to tell their healthcare provider if they have a history of HBV infection [see Warnings and Precautions (5.1)]. Advise patients to seek medical evaluation immediately for symptoms of bradycardia such as near-fainting or fainting, dizziness or lightheadedness, malaise, weakness, excessive tiredness, shortness of breath, chest pain, confusion or memory problems [see Warnings and Precautions (5.2), Adverse Reactions (6.2), and Drug Interactions (7.1)]. Advise patients to avoid pregnancy during combination treatment with SOVALDI and ribavirin or SOVALDI and peginterferon and ribavirin. Inform patients to notify their health care provider immediately in the event of a pregnancy [see Use in Specific Populations (8.1)]. Advise patients that SOVALDI may interact with some drugs; therefore, patients should be advised to report the use of any prescription, non-prescription medication or herbal products to their healthcare provider [see Warnings and Precautions (5.3) and Drug Interactions (7.1)]. Inform patients that the effect of treatment of hepatitis C infection on transmission is not known, and that appropriate precautions to prevent transmission of the hepatitis C virus during treatment or in the event of treatment failure should be taken. Advise patients that the recommended regimen for patients with genotype 1 or 4 HCV infection is SOVALDI administered in combination with peginterferon alfa and ribavirin and the recommended regimen for patients with genotype 2 or 3 HCV infection is SOVALDI administered in combination with ribavirin. If peginterferon and/or ribavirin are permanently discontinued, SOVALDI should also be discontinued. SOVALDI and HARVONI are trademarks of Gilead Sciences, Inc., or its related companies. All other trademarks referenced herein are the property of their respective owners. ©2018 Gilead Sciences, Inc. All rights reserved. Important: SOVALDI is used in combination with other antiviral medicines. When taking SOVALDI with ribavirin or in combination with peginterferon alfa and ribavirin you should also read those Medication Guides. The information in this Patient Information Leaflet talks about SOVALDI when it is used with ribavirin and in combination with peginterferon alfa and ribavirin. What is the most important information I should know about SOVALDI? Hepatitis B virus reactivation: Before starting treatment with SOVALDI, your healthcare provider will do blood tests to check for hepatitis B virus infection. If you have ever had hepatitis B virus infection, the hepatitis B virus could become active again during or after treatment of hepatitis C virus with SOVALDI. Hepatitis B virus becoming active again (called reactivation) may cause serious liver problems including liver failure and death. Your healthcare provider will monitor you if you are at risk for hepatitis B virus reactivation during treatment and after you stop taking SOVALDI. For more information about side effects, see the section "What are the possible side effects of SOVALDI?" SOVALDI is used to treat children 12 years of age and older or weighing at least 77 pounds (at least 35 kg) with chronic HCV genotype 2 or 3 infection without cirrhosis or with compensated cirrhosis in combination with ribavirin. It is not known if SOVALDI is safe and effective in children under 12 years of age and weighing less than 77 pounds (less than 35 kg) with HCV genotype 2 or 3 infection, or with HCV genotype 1 or 4 infection. It is not known if SOVALDI is safe and effective in people who have had a liver transplant. are pregnant or plan to become pregnant. It is not known if SOVALDI will harm your unborn baby. Males and females who take SOVALDI in combination with ribavirin should also read the ribavirin Medication Guide for important pregnancy, contraception, and infertility information. are breastfeeding or plan to breastfeed. It is not known if SOVALDI passes into your breast milk. Talk to your healthcare provider about the best way to feed your baby during treatment with SOVALDI. Tell your healthcare provider about all the medicines you take, including prescription and over-the-counter medicines, vitamins, and herbal supplements. SOVALDI and other medicines may affect each other. This can cause you to have too much or not enough SOVALDI or other medicines in your body. This may affect the way SOVALDI or your other medicines work, or may cause side effects. You can ask your healthcare provider or pharmacist for a list of medicines that interact with SOVALDI. Do not start taking a new medicine without telling your healthcare provider. Your healthcare provider can tell you if it is safe to take SOVALDI with other medicines. How should I take SOVALDI? Take SOVALDI exactly as your healthcare provider tells you to take it. Do not change your dose unless your healthcare provider tells you to. Do not stop taking SOVALDI without first talking with your healthcare provider. Take 1 SOVALDI tablet one time each day only. Take SOVALDI with or without food. If you take too much SOVALDI, call your healthcare provider or go to the nearest hospital emergency room right away. What are the possible side effects of SOVALDI? Hepatitis B virus reactivation. See "What is the most important information I should know about SOVALDI?" These are not all the possible side effects of SOVALDI. For more information, ask your healthcare provider or pharmacist. How should I store SOVALDI? Store SOVALDI at room temperature below 86°F (30°C). Keep SOVALDI in its original container. Do not use SOVALDI if the seal over the bottle opening is broken or missing. Keep SOVALDI and all medicines out of the reach of children. General information about the safe and effective use of SOVALDI. Medicines are sometimes prescribed for purposes other than those listed in a Patient Information leaflet. Do not use SOVALDI for a condition for which it was not prescribed. Do not give SOVALDI to other people, even if they have the same symptoms you have. It may harm them. You can ask your healthcare provider or pharmacist for information about SOVALDI that is written for health professionals. For more information, call 1-800-445-3235 or go to www.SOVALDI.com. What are the ingredients in SOVALDI? Inactive ingredients: colloidal silicon dioxide, croscarmellose sodium, magnesium stearate, mannitol, and microcrystalline cellulose. The tablet film-coat contains polyethylene glycol, polyvinyl alcohol, talc, titanium dioxide, and yellow iron oxide. For more information, call 1-800-445-3235 or go to www.SOVALDI.com. ©2017 Gilead Sciences, Inc. All rights reserved. Do not cover ALERT box with pharmacy label.